The Greatest atrocities in the history of man kind started with the forcible relocation of a small minority group. 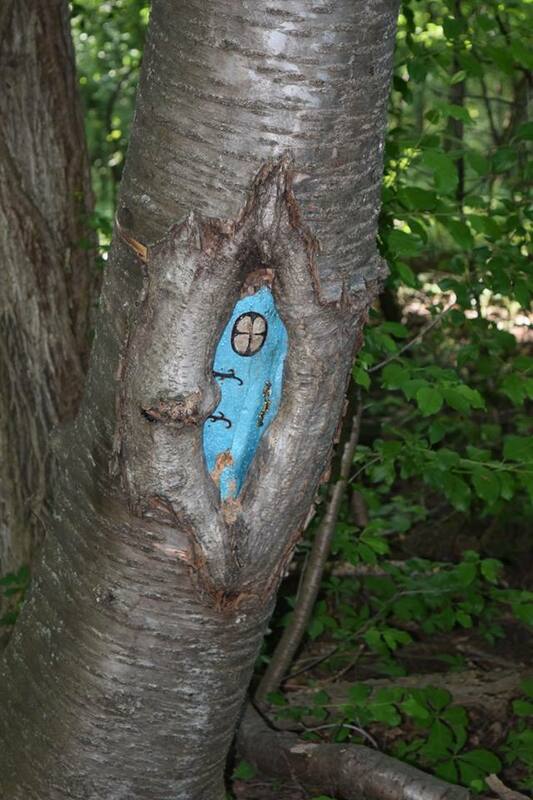 Yet, this past week we see the government of the Town of Henrietta forcible relocate the peaceful Fairy village that has existed for the past five years in Tinker Park. Without due process or a clear location where these fairies would go, the park staff removed the village. The reason the park staff gave? “WE” do not like the type of people that came to visit the Fairies. THEY stated that the Fairy Village attracted people to the park, causing the park to be used by more people. This resulted in the nature trails showing signs of use. 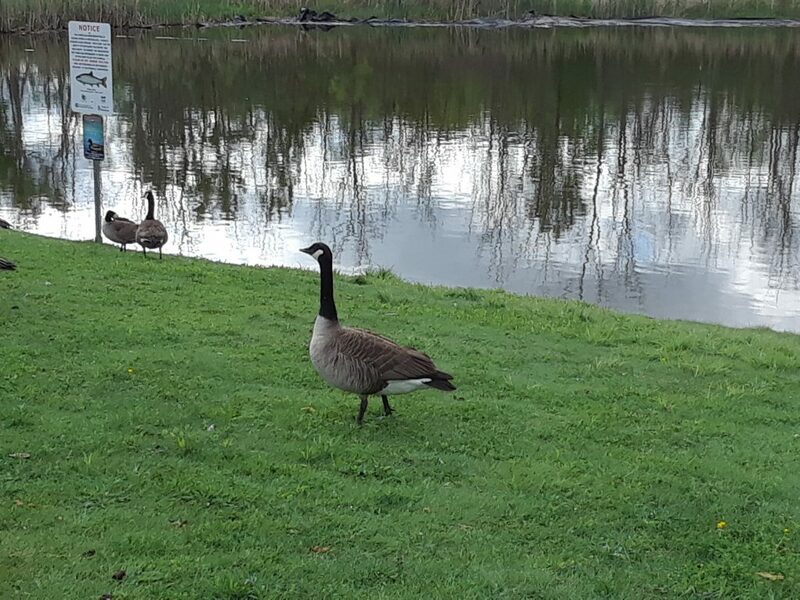 Their complaint of litter is valid, but do you kill the goose that laid the golden age? Is it not the purpose of the park to get more people out to enjoy nature? Does the park not have an environmental message that those who are littering need to learn? Is cleaning litter an act that the park staff feel is beneath them? What the next step? 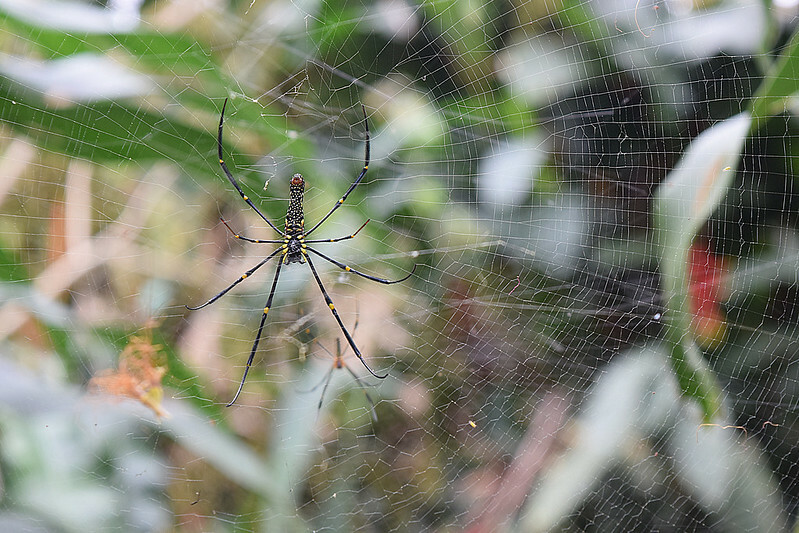 I and many other enjoy the wild life found in the park. Will the park staff start to kill off the waterfowl and deer that call the park home so fewer people will use the nature trails? I enjoy walking the few trails the Tinker Park has. 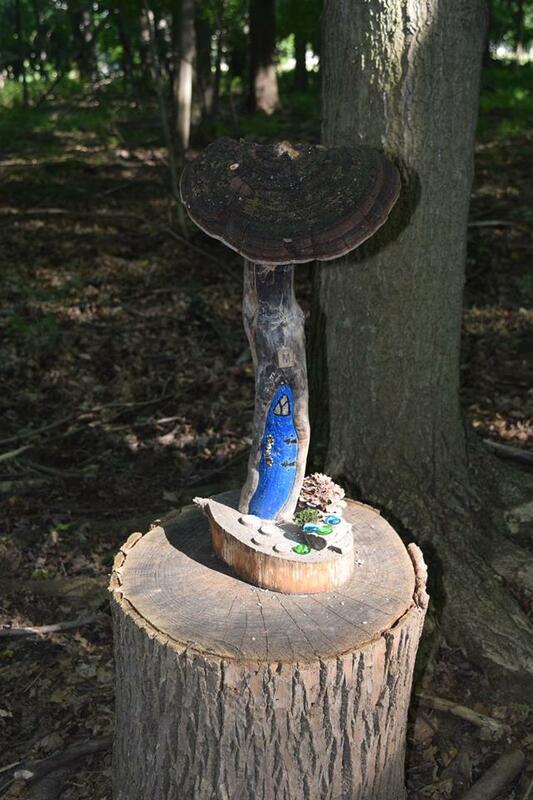 It WAS good to see young families walking the trails and the enthusiasm the children had while looking at the Fairy homes. I see the removal of the Fairy Village as a statement from the Park, that the children even the adults of our town are not important to them. I understand the concern about litter, but this is not the way to address the issue. The concern about the trail use? If more people using the trails are wearing them out, then increase the budget for the park. We need more people out in the outdoors, learning about nature and what we need to do to save our environment. Get them away from cell phones and online games and out to see the ducks, geese, squirrels and the deer that lives around the Fairy Village. Bring back the Fairy Village. Protect minority rights. While in Davao Philippines recently, I visited the Philippine Eagle Foundation’s conservation Center. It took an hour by Grab to get to the center which is in the outskirts of Davao City. The Philippine Eagle, (Scientific Name: Pithecophaga jefferyi) also known as the monkey eating eagle after its favorite food, has a Critically endangered Status. It is believed that there are less than 400 pairs remaining living in the wild. Eagles found injured are brought to the foundation with the goal of getting them well and returned to the wild. 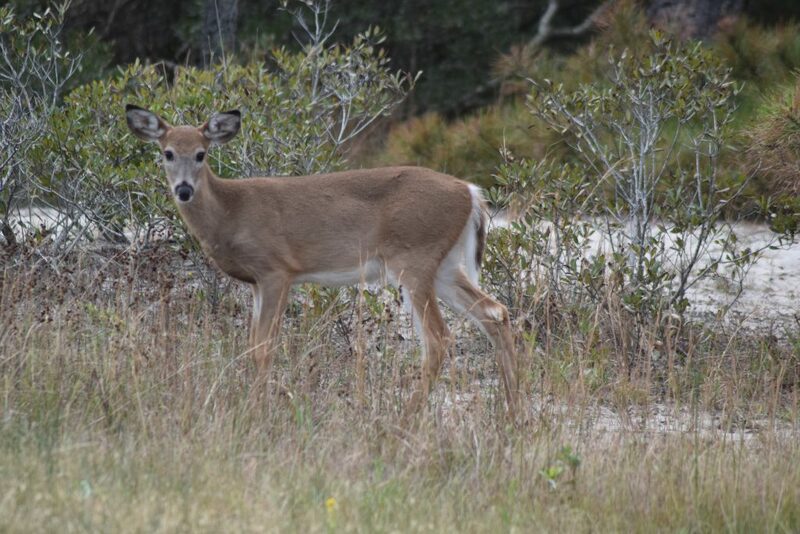 If they can not recover fully and are unable to hunt for themselves they will stay at the conservation center. Birds at the center are also used in a research and a breeding program. 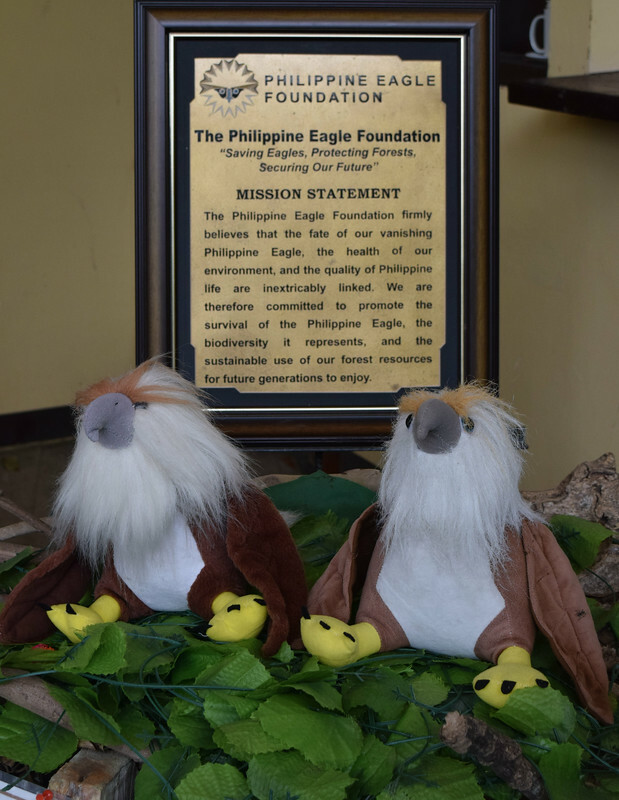 There are currently 7 Philippine Eagles in exhibit for education while the rest are isolated for conservation breeding and research purposes. The center is also home for other birds of prey who can not return to the wild. 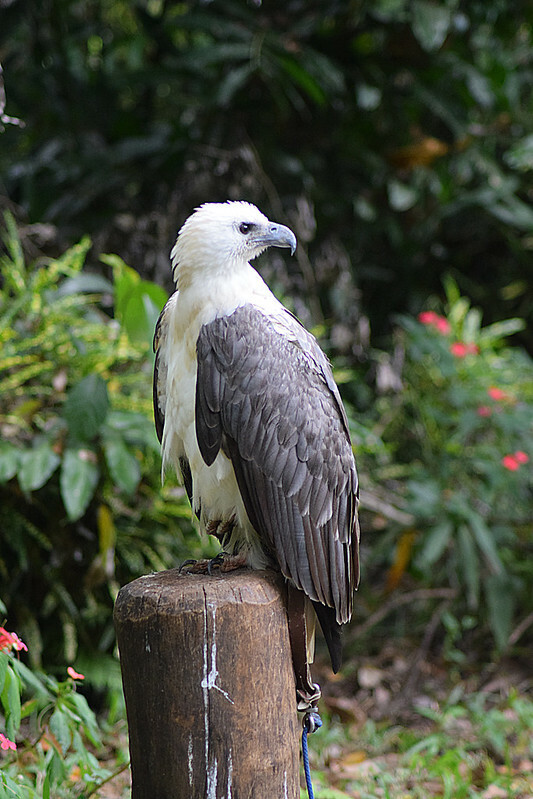 From their website: The Philippine Eagle Center (PEC) is an 8.4-hectare area located at the foothills of Mt. Apo in Malagos, Baguio District, Davao City and situated within the Malagos Watershed. 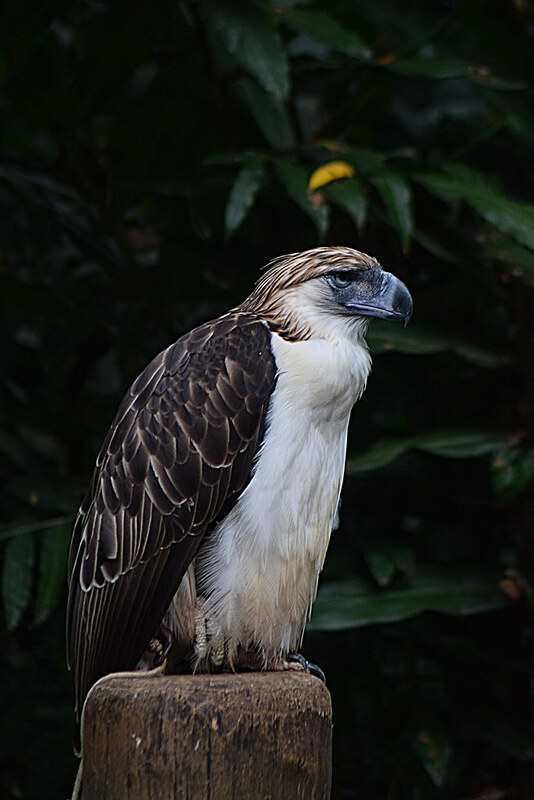 The Philippine Eagle Center primarily operates as a conservation breeding facility for the critically endangered Philippine Eagle (Pithecophaga jefferyi) and other birds of prey. Conservation Breeding Area. This is where the breeding birds are found. This area is restricted to the public and only the conservation breeding personnel are allowed in its premises. Food Stock Area. This is where the food for the raptors and other animals are raised to ensure a disease-free stock such as rabbits, white mice, quails, and guinea pigs. These stocks are needed for the daily food requirements of every animal at the Center. The close canopy (covered by trees) area is a natural forest adjacent to the Malagos Watershed. Here you will find large old trees and the first few cages that the Philippine Eagle Foundation ever built. Being a natural forest, this part of the Center is relatively rough compared to the rest. 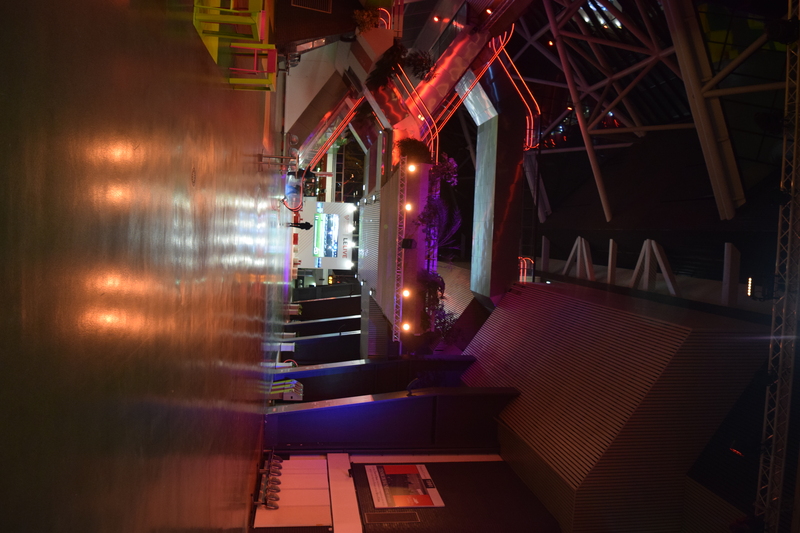 The plaza/exhibit part is an open canopy area with concrete pathways leading to every enclosure, kiosks and benches available for the guests. The conservation center is a little underwhelming. Overall, it is very small but depending on the amount of time you watch the birds and other wildlife can take you anywhere from 30 minutes to 2 hours to see. Three hours for photographers. There are a number of cages that each house one bird, mostly Eagles the rest other birds of prey. A audio video presentation is also available. I love this photo. The baby is trying to climb the tree. Look closely and you will see the mother is holding the tail making sure he not getting away. 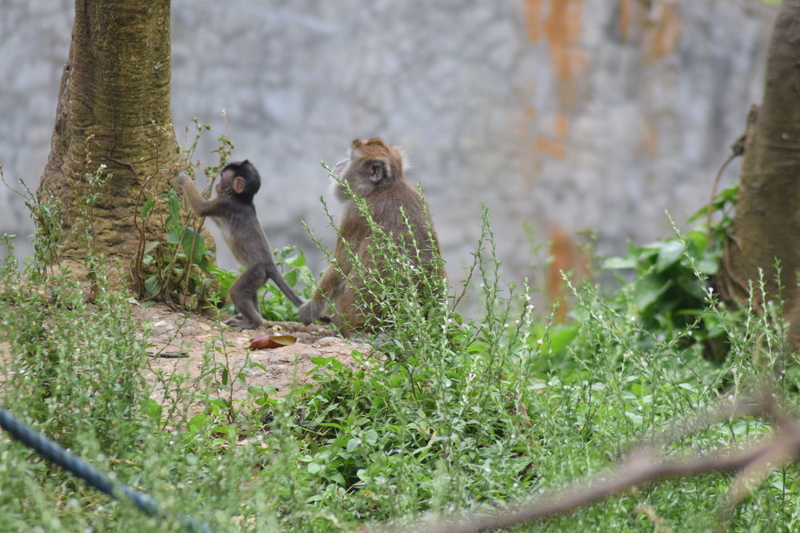 There is an “island” of Long-tailed Macaque. I will admit it was amazing watching the social interactions these primates had between themselves. It is found nowhere else except in the Philippines where it is the country’s national bird. Losing the species to extinction would also mean losing a nation’s precious biological heritage. It represents a rare product of evolutionary creation. Based on recent genetic studies, it has no close relatives left among the living species of eagles in the world. Losing them would mean an irreversible loss of a unique species. 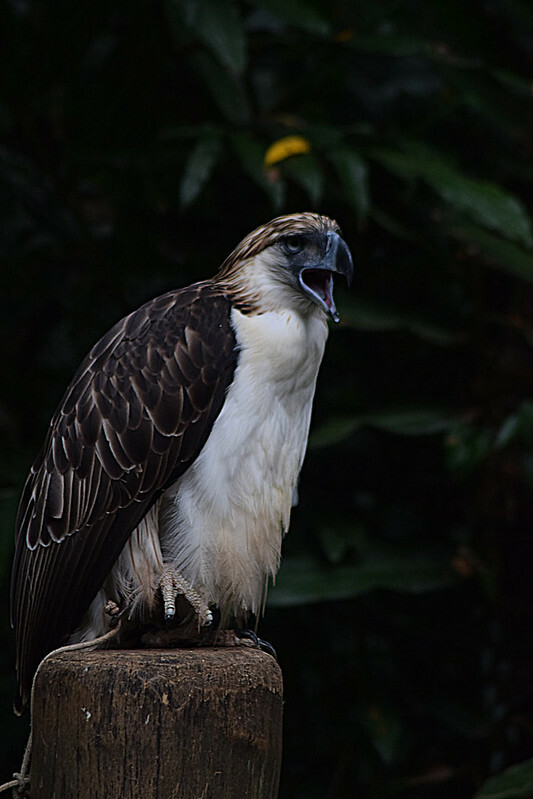 The Philippine Eagle is the top predator of the Philippine tropical rainforest. 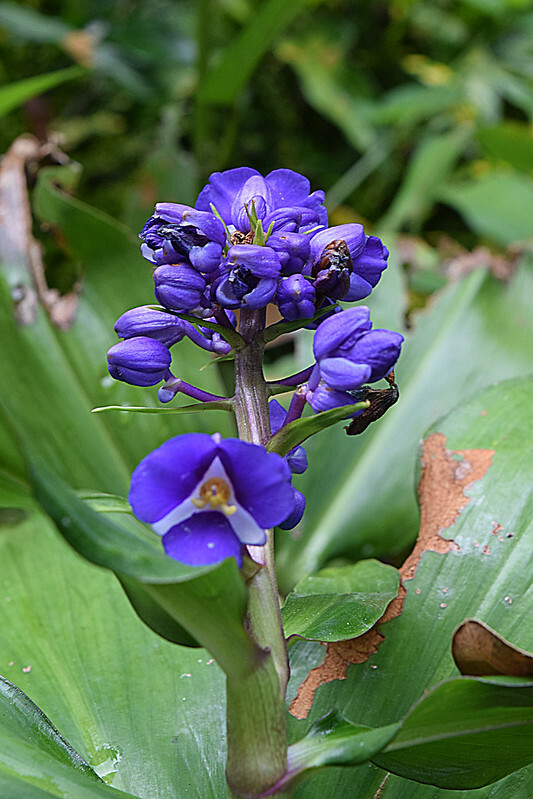 It plays an important role in keeping the ecosystem in balance and provides an umbrella of protection to all other life forms in its territory. The Philippine Eagle is embedded in the oral histories and other cultural artefacts of several indigenous groups in the country. This indicates that it performs a role in the human production of unique cultures. Economically, the presence of a healthy eagle population can also be a source of livelihood for the communities living near its area such as eco- tourism. 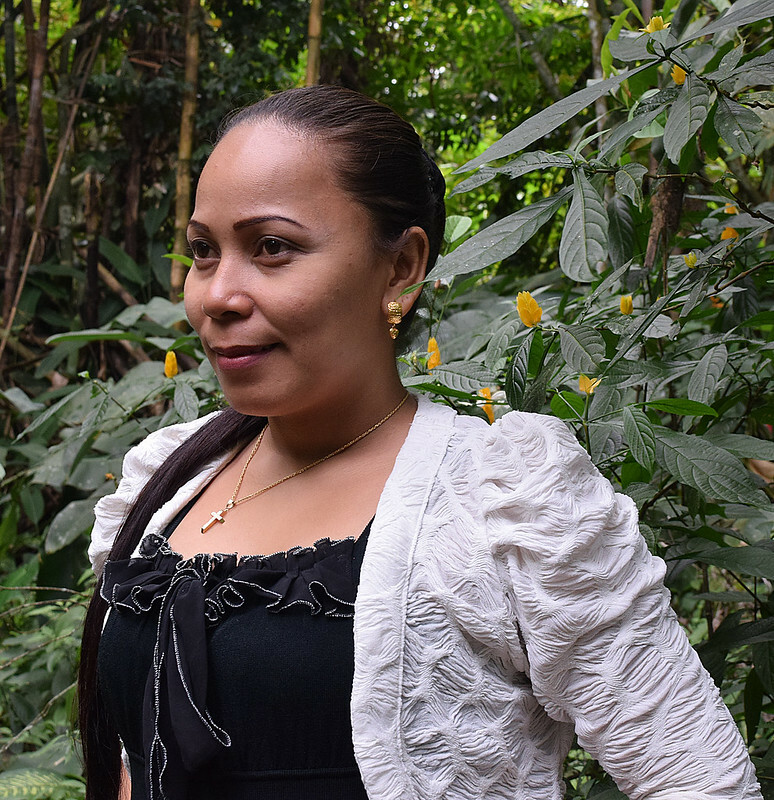 Additionally, a healthy forest helps control soil erosion, mitigate the effects of climate change, minimize flooding, and provides additional sources of food, medicine, clothing, and shelter for our people. These different spectrum of values unifies the diverse facets of our society. The role that the Philippine Eagle plays rightly deserves its title as the Philippine’s national bird- a symbol of unity, beauty and hope. This underscores the need to protect it for future Filipinos and the rest of the world to benefit and enjoy. Entrance to the center is only 150 pesos for adults, less for children. That is about USD 3. We took a Grap (merged with uber last year) to the center from downtown to the center for about 700 pesos, $14. Our return trip, we took a trike to the transportation center nearby for less than a dollar and from the transportation center took a L300 (a commuter style van) back downtown for about $1 each. Overall a very nice outing. They dream of the perfect dive vacation. Diving at remote dive sites with perfect visibility, warm waters and more marine life than they could ever imagine in one place. 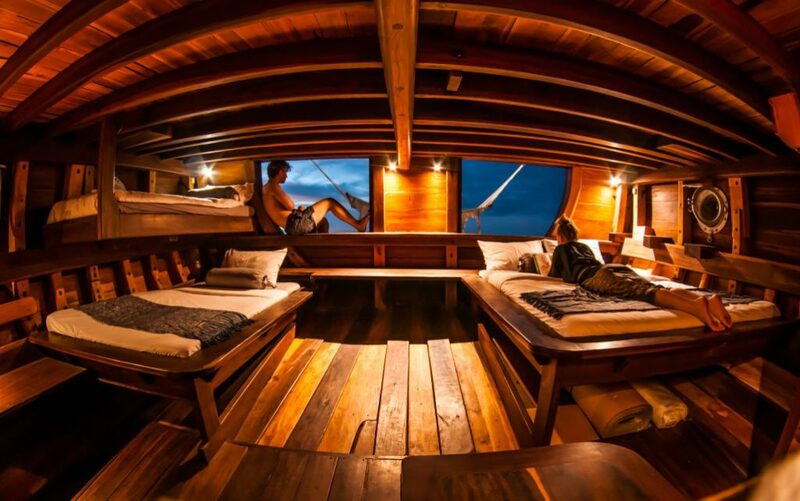 They want a liveaboard that is more than just a dive platform and someplace to eat and sleep. They want something comfortable, even luxurious, but not stuffy and snobbish. Someplace as suitable for a bottle of local beer as it is for a bottle of imported Champagne. It needs to be modern with all the comforts of home, but still maintain the feel of an era long ago past. They see themselves watching the sunset with a love one as the rays of lights highlight the grain of the teak wood decks. When those dreams come true, they find themselves on a handcrafted Phinisi yacht sailing and diving the Indonesia archipelago. A vessel that pays homage to the culture and craftsman who created her. They find themselves on the Nataraja. Nataraja is the Hindu connection between the spirit and the arts, and is the perfect name for this 32 meter Phinisi yacht. Since ancient times, the boat builders of South Sulawesit have been building boats. First it was simple fishing boats, so they can feed themselves, later larger vessels such as a Phinisi for exploration and trade. As the builders skills improved, they passed it to the next generation becoming in itself an art form. A Phinisi is a traditional Indonesian two-masted sailing ship, generally built from Ironwood and Bangkirai with teak being used as finishing. Yacht owners took notice of the craftsmanship of these vessels and soon the were being built as custom designed yachts. The keel of the Nataraja was laid in 2015, making her first sailing in 2016. She was built with an eye on comfort and luxury. Nataraja’s deck plan is one with an open living concept as well as privacy. There is a large shaded dining area for al fresco dining, and a spacious lounge at the stern. Nataraja has 5 cabins aboard, 1 master cabin and 4 Double cabins with an optional 3rd Bed. The master cabin boasts a private terrace in the stern with two large windows, offering splendid views of the sea. It has 1 large bed and two smaller ones, with a bench and desk. Each cabin is air-conditioned and has a private bathroom with a hot water shower, sink and toilet. She is designed to carry 9 adult passengers and 4 children in four beautiful cabins, with the fifth cabin generally reserved for the cruise director/tour guide. 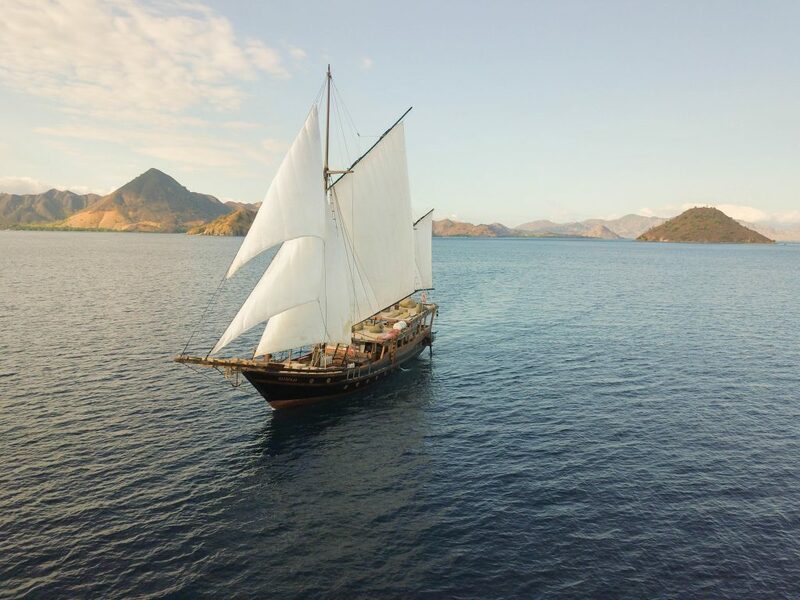 Depending on the season and your personal preference you can charter the Nataraja for sailing Komodo National Park, a UNESCO world heritage site or Raja Ampat. Komodo National Park is best known for being the home of the Komodo dragon, the world’s last living dragon and the largest lizard. Komodo National Park includes three major islands: Komodo, Rinca and Padar, as well as numerous smaller islands. The scuba diving is some of the best in the world and there is diving for all skill levels. The Nataraja can take you to Pink Beach for an unforgettable picnic after snorkeling in the crystal clear waters with manta rays. Later trek to the peak of Padar for one of the most incredible views in the world. The balance between land excursions and diving is up to you, it is your yacht. Raja Ampat translates to “Four Kings” a name to honor the 4 main islands. It is a land of breath taking land and seascapes. These easternmost islands of Indonesia have drawn adventurers and explorers for centuries. Today they also draw scuba and free divers. Indonesia is included in the Coral Triangle, the area considered the most bio-diverst in the world, and the Raja Ampat area has one of the highest number of different species within the coral triangle. Being remote and in an area of scattered population and low urbanization means you will find pristine conditions for both diving and sailing. The traits and details that make the Nataraja the perfect liveaboard for scuba and free diving also lend themselves for making the Nataraja perfect for other styles of sailing vacations. Feel for yourself why yacht owners around the world hold Phinisi style yachts in such high regard. Visit remote islands in the Raja Ampat that get few if any tourist. See what it is really like to live here. If you enjoy kayaking, let the Nataraja bring you to places that are so incredibly beautiful that words alone cannot describe. Being the one responsible for planning a dive vacation for a scuba diving family or a small dive club is a daunting task. Even after shifting through dozens of suitable dive destinations, you then have to find a liveaboard that is just perfect for your group. 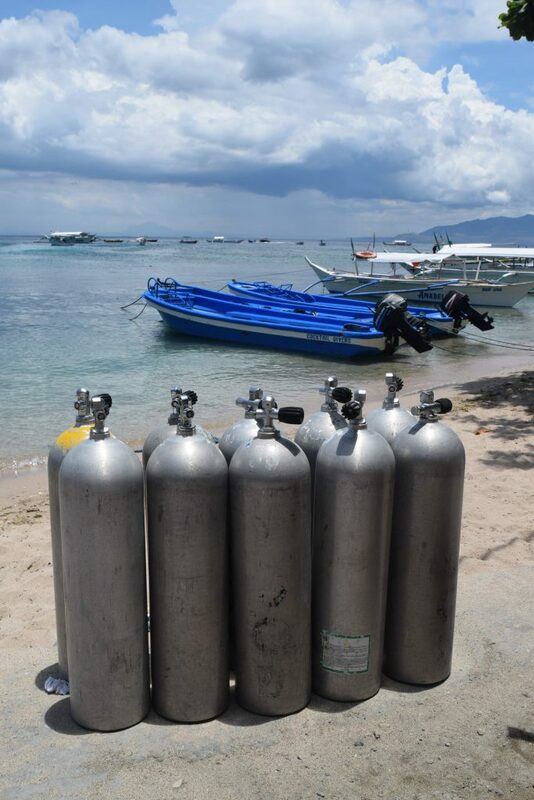 Diving a Phinisi style yacht in Indonesia is the perfect solution. 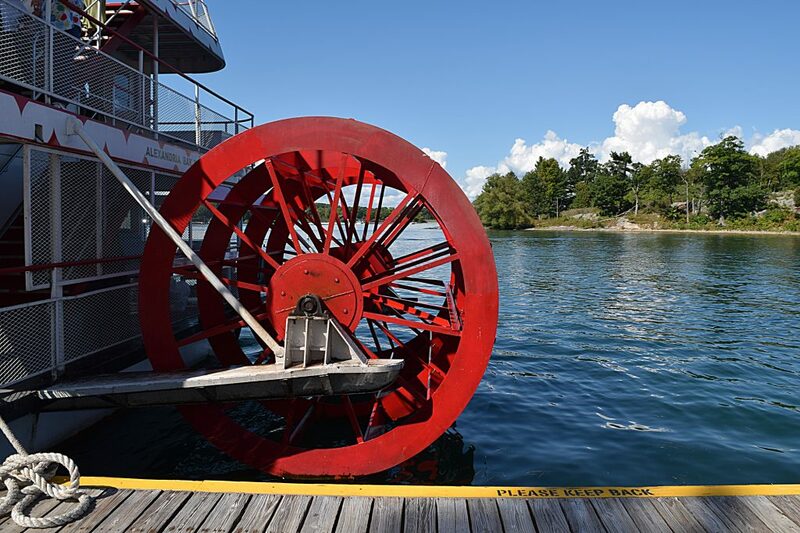 As Summer was winding down, I decided to take a trip to the Thousand Islands. 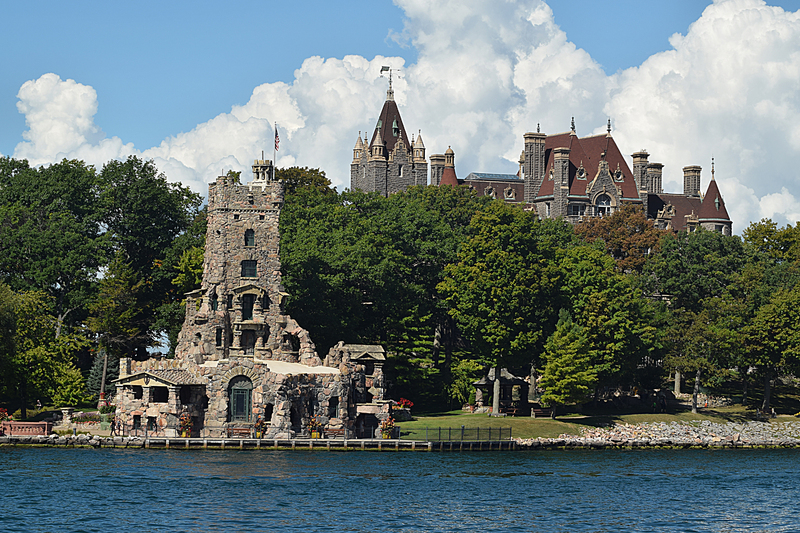 The Thousand Islands has a rich history that helped shape both the United states and Canada. It was a factor in the War of 1812, was popular with Presidents in the late 1800s, and many millionaires built summer retreats here in the 1930s. The area is still a very popular summer getaway. For those not in the know, The Thousand Islands is in the area where the Saint Lawrence River meets Lake Ontario. 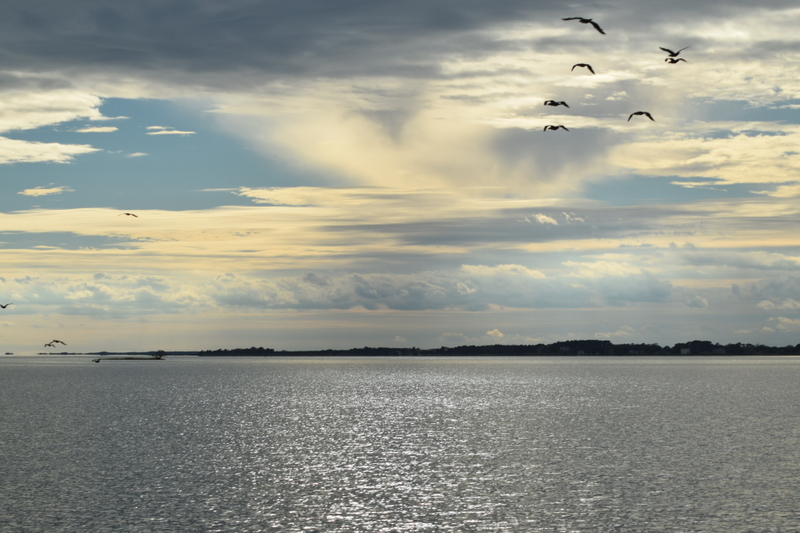 The Saint Lawrence River is the passage allowing the Great Lakes to empty into the Atlantic Ocean. The first fifty miles or so has many islands. 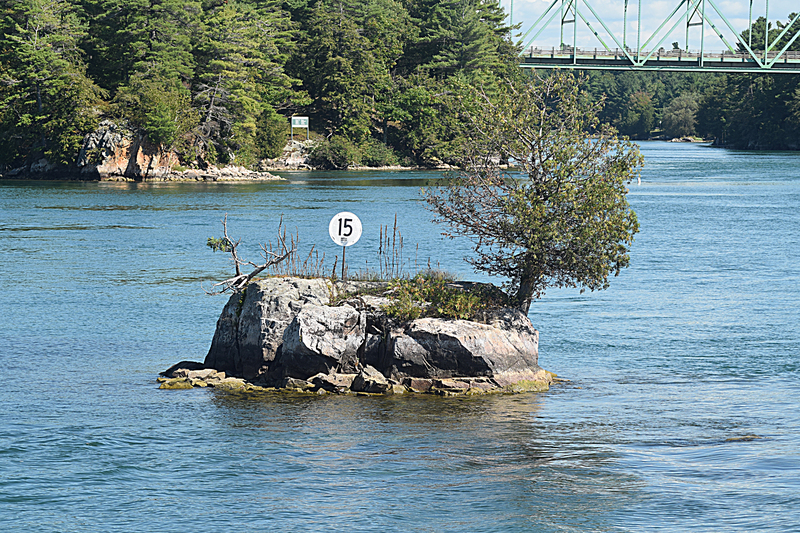 While the area is known as the Thousand Islands, the official count is 1,864 islands. To be considered an island, the land must have at least one square meter of surface always above water. 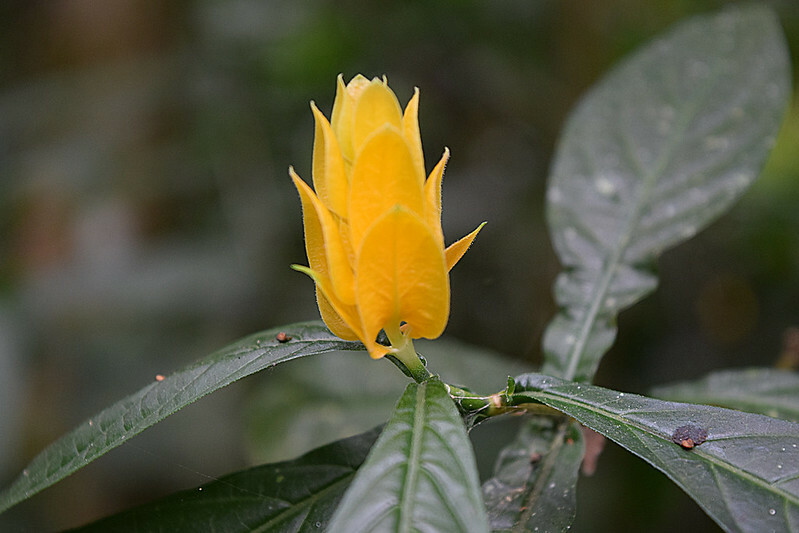 It also most have at least one tree and additional vegetation. 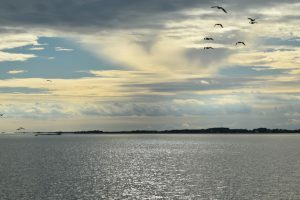 The Saint Lawrence River also forms the border between the US and Canada. So some islands are in Canada and some in the United States. The border is not a straight line nor does it follow the center of the river. A treaty at the end of the War of 1812 divided the islands so that each country received the same land mass. However, Canada received more islands. The division impacted the border. The largest island is Wolfe. This island is about 29 kilometers (ca. 18 miles) long, with its width varying from around 9 kilometers (5.59 miles) to a few hundred meters at some points; its area is about 124 square kilometers (48 square miles). 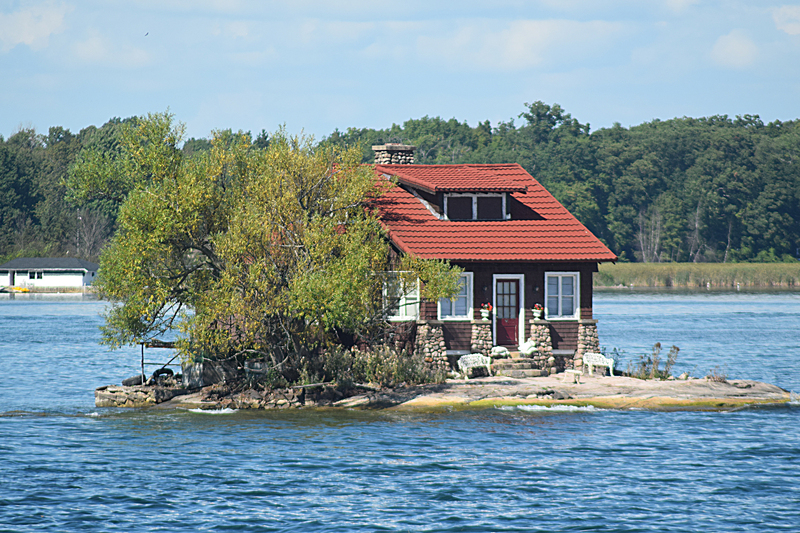 The smallest island is Tom Thumb. 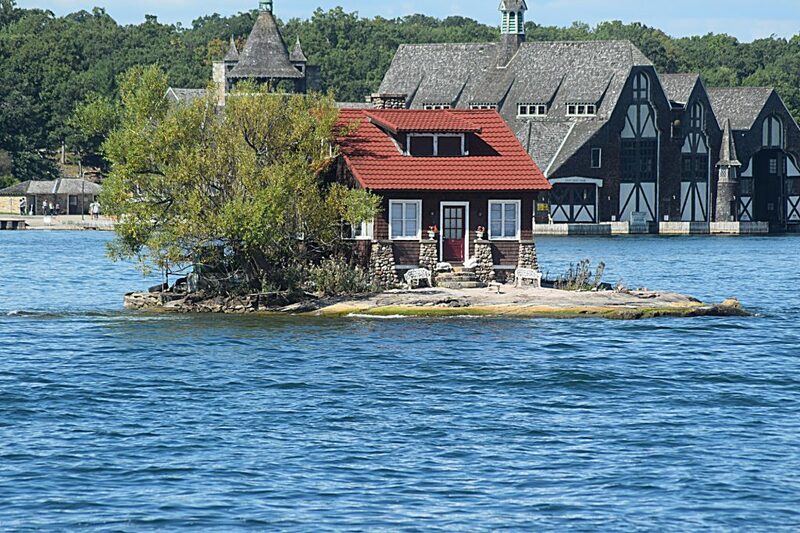 Just Room Enough Island, also known as Hub Island is the smallest inhabited island in the world. The island is about the size of a tennis court. 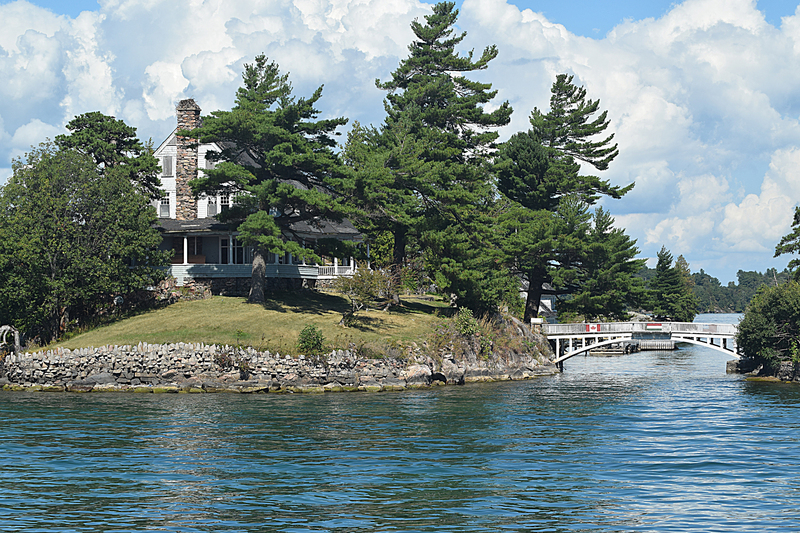 Purchased by the Sizeland family in the 1950s, the island has a house, a tree, shrubs, and a small beach. Local tour guides often misrepresent this house as being built by Bolt for his mother-in-law. Heart Island home of the Bolt Castle is the closest island to Just Room Enough Island. Just Enough Room in front and Bolt’s Boat house behind. Please note the telephoto lens makes them look closer together than they are. “George Boldt, general manager of the Waldorf-Astoria Hotel in New York City and manager of the Bellevue-Stratford Hotel in Philadelphia, and his family enjoyed an earlier frame cottage on Hart Island (the island’s original name) for several summers, which they greatly expanded. In 1900, George Boldt launched an ambitious construction campaign to build a huge masonry structure, one of the largest private homes in the United States. 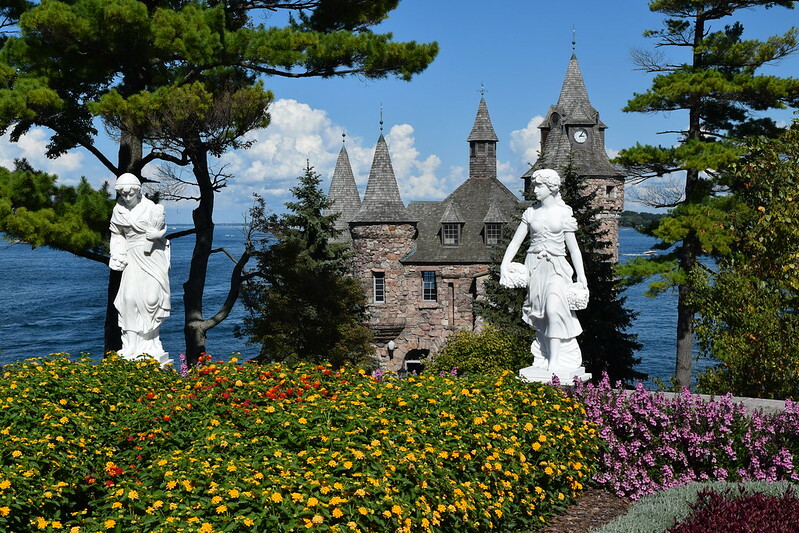 He engaged the architectural firm G. W. & W. D. Hewitt and hundreds of workers for a six-story “castle” as a present to his wife. In addition, four other masonry structures on the island are architecturally notable. Equally distinctive is a huge yacht house on neighboring Wellesley Island, where the Boldts had another summer home and a vast estate, incorporating farms, canals, a golf course, tennis courts, stables, and a polo field. I remember 30 years ago taking a boat tour of the Thousand Islands and the tour guide pointing out the “shortest International Bridge in the world”. On the tour I went on, they also pointed out the bridge and added a story about the owner having to pay taxes in two countries. However, maps from both the US and Canadian governments show that both islands belong to Canada. Still, it a nice story and great photo op. 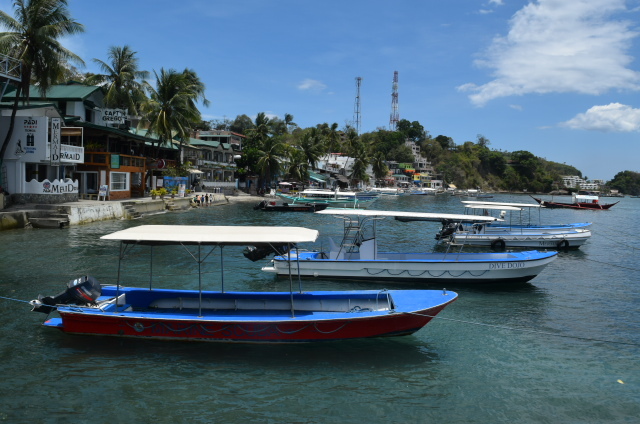 There are boat rides from both side of the border that will take you around the islands. 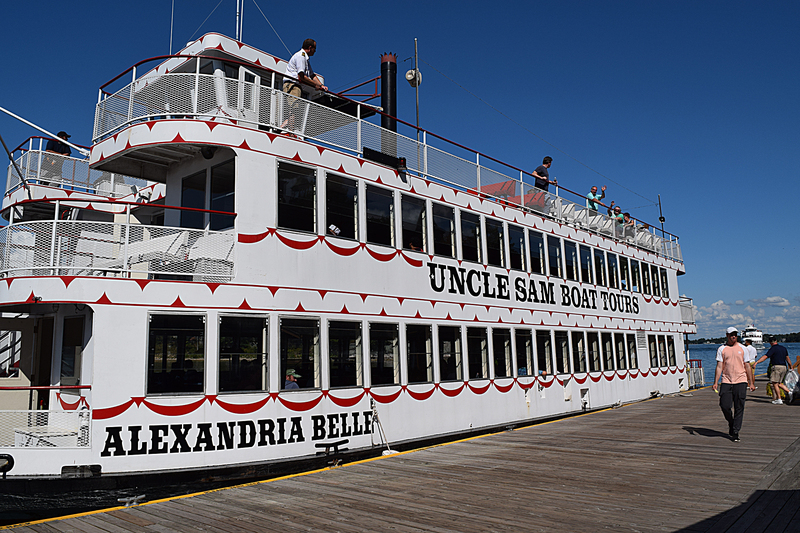 Uncle Sam Tours from Alexander Bay is the one I used and highly rate it. The boat stops at Heart Island before returning to Alexander Bay. You can get off here and pay the entrance fee to visit the island and the castle. To return to the mainland you can take the next tour boat or a shuttle. Having an unexpected trip to Delmava, I decided that I should check off one of the items on my to do list. 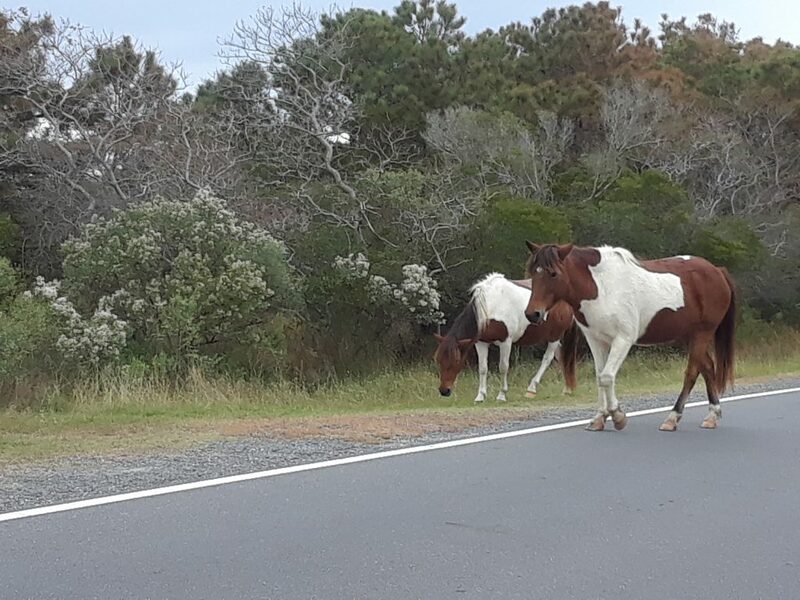 Namely, visit the Assateague Island National Seashore and stay overnight. It was a fast look online for camping equipment and a trip to Field and Stream and I had a nice small tent and a sleeping bag. Both on sale I might add. After finishing a car rally with my brother, I headed to Ocean City Maryland and then the nearby national seashore. I had bought a multiple agency senior pass last year before the prices went up and that allowed me free entrance as well as a 50% discount on the camp site. I drove around the park and it was not long before I sighted a few horses. Sadly the only time I spotted horses was when I was in the car. Being a chilly Sunday, the camp grounds were near empty. 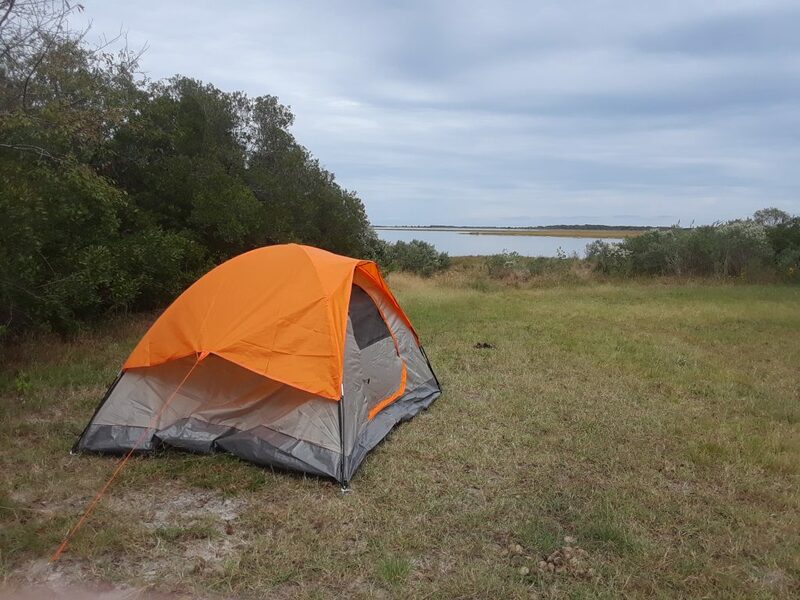 I found a wonderful site on the bay side, registered at the camping office and returned to the site to set up the tent. Then it was a another drive in the park, followed by a walk along the sand dune. The walk was very interesting and I found out why they suggested aqua shoes instead of hiking boots. It was hard going along the dunes but much easier by the surf. I then went for a hike along one of the nature trails. I did not see anymore horses, but did come across some deer. The camping ended up pretty good, it was a little chilly but the sleeping bag was warm enough. Did not like the sleeping bag. I sleep on my side and the bag would not move well enough. So come spring, I will spring for a new bag. For my first overnight camping trip in decades it went very well. Come spring, I will start camping. As a writer that specializes in Scuba Diving and Scuba related travel, I spend a great deal of time looking at websites. Recently, Surface Interval (www.surfaceinterval.co) has announced they are now launching their new website. Surface Interval is looking to create a site that highlights Worldwide Scuba Diving Reviews. Scuba divers can leave reviews of the dive centers they have used. For those of you who are familiar with my writing and may follow me on Deeperblue.com, will see that their quote hits a topic I strongly believe in. It sort of hits two. I totally agree that as a group scuba divers are more concern about the environment. In the news recently was the launch of The Ocean Clean Up device — System 001, “Wilson”. That company’s goal is to help clean up the Great Pacific Garbage Patch. They are doing a test run of the technology they developed and if the test run is successful, they will start a full effort of gather plastics and other items from the garbage patch. How does this relate? Boyan Slat, the 18-year-old CEO and founder was shocked at the amount of plastics in the water on his very first scuba dive. He set his mind to changing that. The other point that Surface Interval makes is the need to introduce more people to diving. Any effort like that I applaud. As with any new business or website, growing can be slow. I am adding a few reviews of dive centers I have visited in the last six months, maybe you can do the same. To be effective, the site will need current information from the divers that have been there. Let other divers know what you liked and disliked on your recent dives. How was the dive center? What was the condition of any rental equipment? How was the diving? Anything else that might help a diver to understand how your trip was. If you are planing a new trip, take a look at the dive centers they have listed. They show having over 2,000 dive centers around the world. If you are a dive center check the website and see if your information is there. They state they have 2337 dive centers listed. While they have been in contact with many dive centers, the listing have come from different sources. It is possible that the information for your dive center came from an outdated source. Take a look at the listing, update it as needed and let your clients know that it is available on the site. What are the best places in the world to go scuba diving? The best way to find out is by hearing other scuba divers’ opinions. And this is exactly what Surface Interval is for! The possibility to review dive operators worldwide (dive shops/schools, liveaboards or dive resorts) decreases your chances to choose the wrong operator. Do they use new equipment, safe dive boats, small diving groups and do they care about conservancy? Important things to know before choosing your scuba diving operator, right? When you read what other scuba divers have experienced while diving, it easy to get inspired and plan your next trip. Imagine you are enjoying a walk around Paris and find yourself needing a restroom. You do not really see anywhere nearby and a quick check on your map program shows the nearest fast food place is 2 kilometers or a mile away. The few places serving food and drinks near you look crowded and while there has to be one you do not spot a restroom. I do not have to imagine it as that was me one day while sightseeing in Paris. 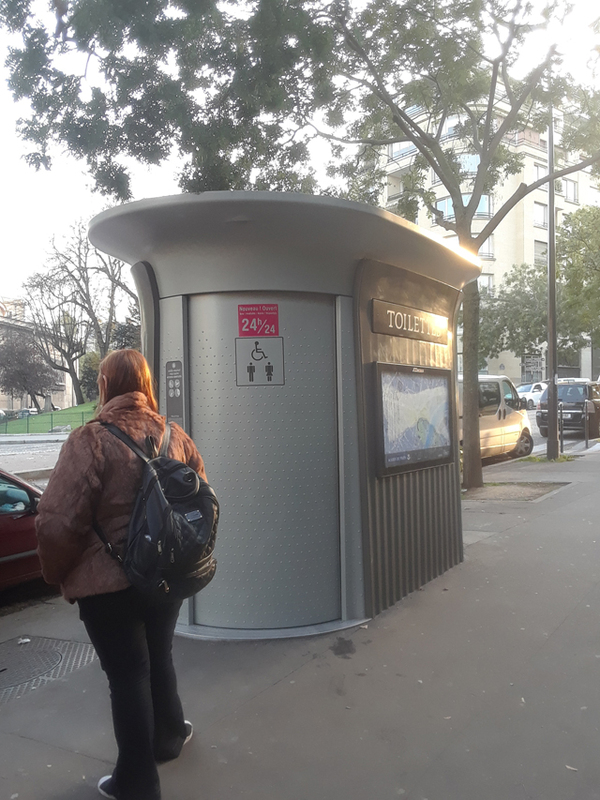 Finding toilets in Paris and many other locations in Europe is not always simple. When you do find them, they might be something you never seen before. This restroom is available 24 hours a day and is free. It allows one user at a time. When I finally got inside of the pod shown above, I was surprised about the size. I am going to guess the inside was about 5 feet (ca. 152 cm) wide and 8 feet (ca. 244 cm) deep. By the door was a sink with a mirror and a hot air hand dryer. Along the back was a toilet and there was a changing shelve for a baby. Plenty of room for a stroller or a wheelchair. When the person in front of you opens the door and comes out, you can not rush right in. As you can see from the instructions above there is a procedure to follow. 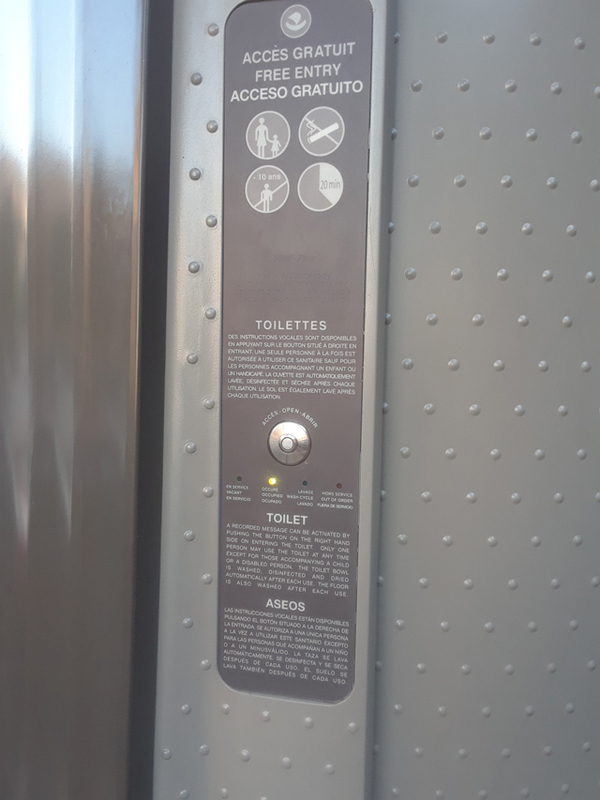 When the door opens, the light on the panel turns red for out of service. About 10 seconds later, the door closes, the wash cycle light comes on and it goes into a wash cycle. This takes about an hour. Okay it takes about five minutes, it just feels like an hour as you are waiting in line. During the wash cycle the toilette bowl is cleaned and sanitized, the sink is washed and dried and the floor is washed and dried. I have no idea exactly what is going on, but it reminds me of the sounds of an automatic car wash, including a vacuum that gets the water off your car to dry it. When the wash cycle is finish the vacant light come on. You can then push the button to open the door. Pushing the button while in the wash cycle does nothing. When you step inside it is all stainless steel and everything was dry. It even had a nice clean and fresh smell to it. A recorded voice, in different languages, tells you to hit the close door button and informs you to press the button again to leave. The voice also says that additional information is available by pressing the information button. Take your time and relax but not too long. If you are not done in 19 minutes, a voice will warn you that the door will open in one minute. In other places, similar rest rooms are available but they may cost you. 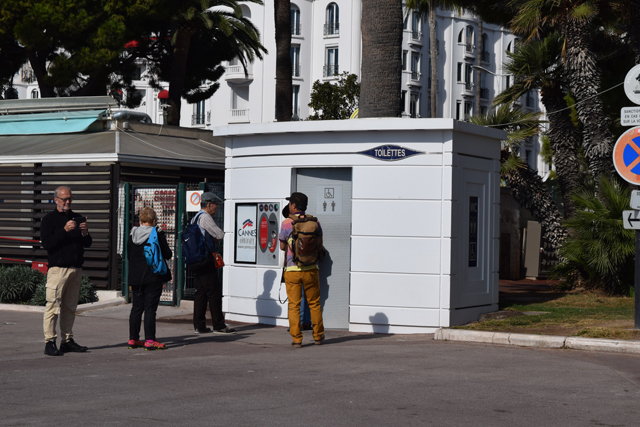 The rest room shown here in Cannes was a pay for use. It also cleaned between guest. Train and bus stations have a great deal of foot traffic and many people will need to use the facilities. Seldom will you find one free but they are there and very handy when you need one. Some will have an attendant collecting the fee, while others will use a turnstile like a subway. Expect it to cost about 50 cents, some may be a Euro or even higher. Most train stations and bus stations will have large public bathrooms. However, you may come across smaller private ones similar to the ones on the street in concept. I am sure we have all done it. You need a restroom so you stop in at a nearby fast food restaurant. You see the rest room sign and the smaller sign that says restrooms are for customer use only. You keep going, do what you need to and leave. That might not work in some places in Europe. See, you need to key in a code to open the door, and the code is on your receipt. Standardbred Racing with a Twist. 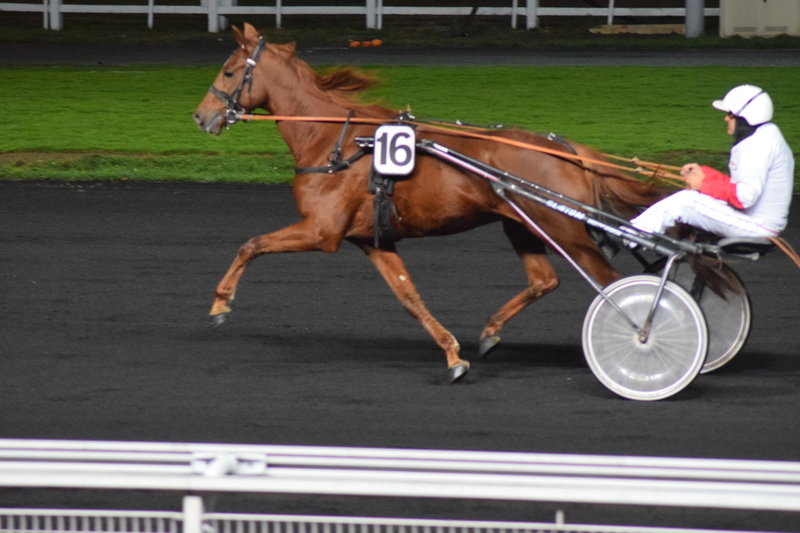 The evening I spend watching the trotters race at the Vincennes Hippodrome in Paris was great. 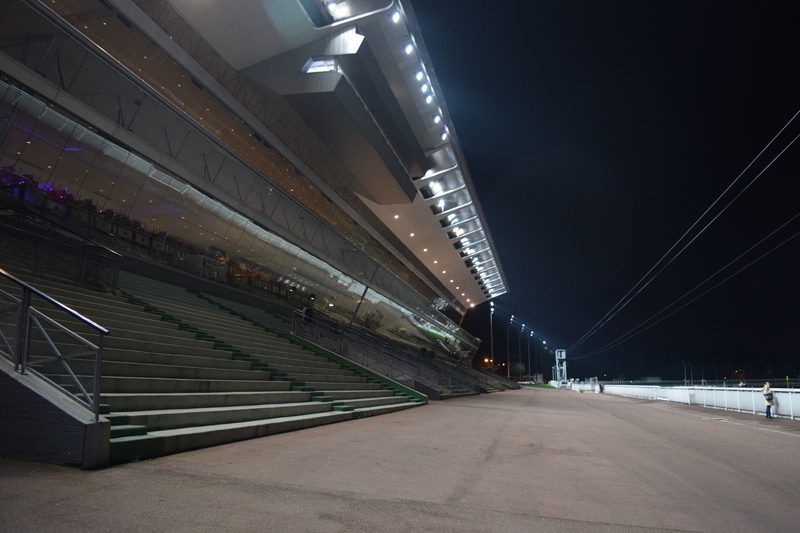 I mention some of the highlights of the track in the post VINCENNES HIPPODROME OF PARIS. The racing experience was different as well. Yes they were racing standardbreds, but there were many differences in how they raced. Here are some of my observations. In the United States there are more pacers than trotters. In Canada there seems to be more trotters but there is still a good number of pacers. In Europe, they have trotters. When I was living in Germany, I only saw trotters racing. In fact the name of the sport translates to trotting horses. The French counter part of the United States Trotting Association is LeTrot. The night I went to the races there were eight races. All of them trotters. Another difference was that two of the eight races were under saddle. While there are some races under saddle in the United States they are primarily demonstration races. The coloring is more varied in the European trotters. In the US, when a horse goes off stride (changing gaits) the rules require the driver to pull the horse to the outside and bring them back on gait. The horse must also not gain a distance advantage. If these actions happen, then the horse can rejoin the race. A prime example here is the November 25th race that my 1% horse Nower Power was in. Approaching the finish line in a clear second place, he broke stride. The driver tried to bring him back on stride and took him outside. He cross the finish line still off gait. However, as he did not gain a distance advantage, he was declared to finish second. In Europe, if a horse changes gaits, they are disqualified. There seem to be more horses going off stride but part of that is likely how they race. More later. In the US, we use drivers behind the horses and riders if mounted. In Europe, they are jockeys. Also in the US, drivers register their own colors to wear while racing. In Europe, the jockeys wear the colors of the owners. Here is a surprising one for me. When we race in the US almost all of the races are at 1 mile, that is 1,600 meters. Some fair racing might be longer, but races where you bet are all 1 mile. Thoroughbreds race at different distances but not Standardbreds. My evening at the races in Paris saw the shortest race at 2,100 meters or about 1.3 miles. The longest race of the evening was 2,850 meters or about 1.75 miles. 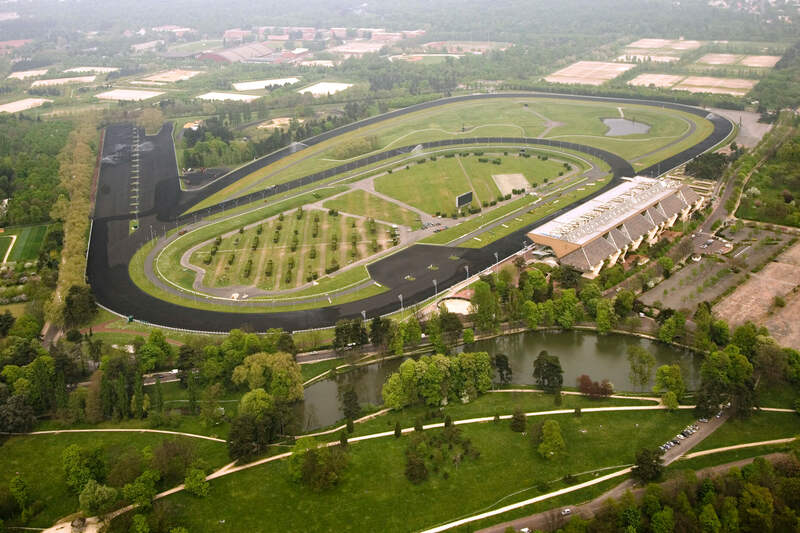 An Aerial View of Vincennes Hippodrome. 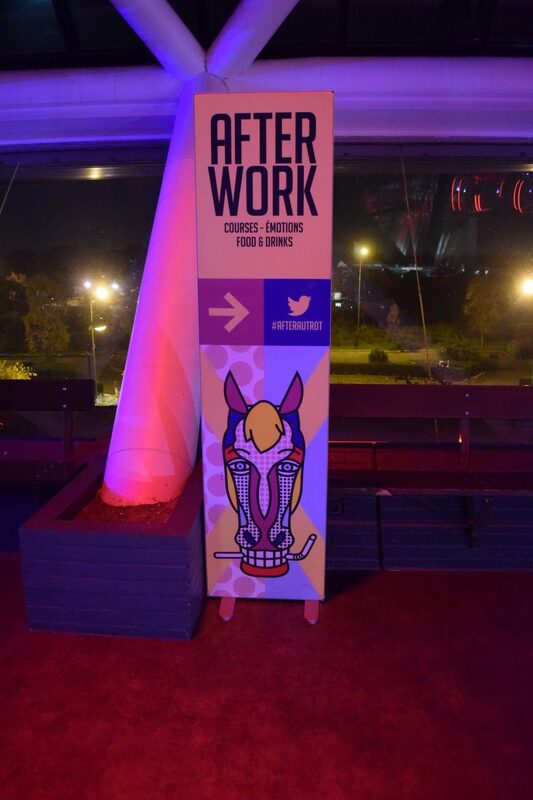 Image by Vincennes Hippodrome. In the US we have bank oval tracks. Generally you will find a race track has a track that is ½ mile, 5/8 mile or a mile long. Having each race at one mile the horse always start at the same position on a track. 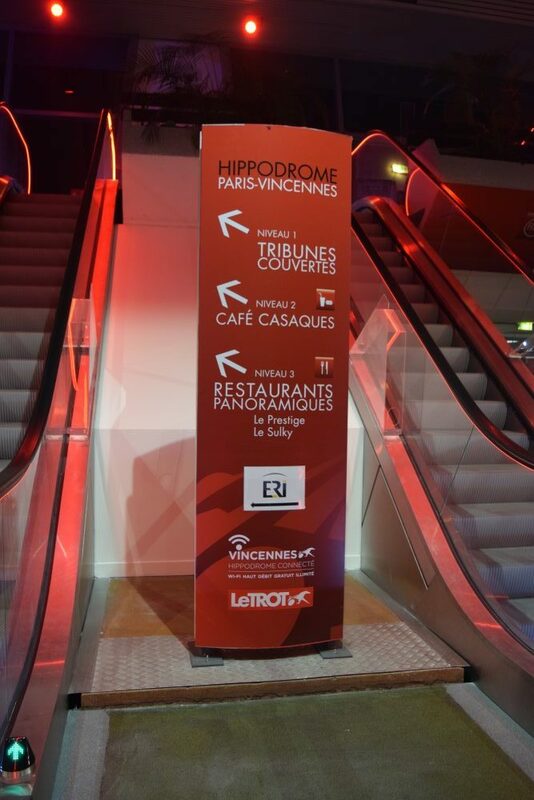 Vincennes Hippodrome is different. Not only do you have different starting points, you can have different tracks. If you look at the aerial photograph and the diagram you can see how the track is laid out. The day I attended they only used the smaller track PP. These videos will help understand the course. 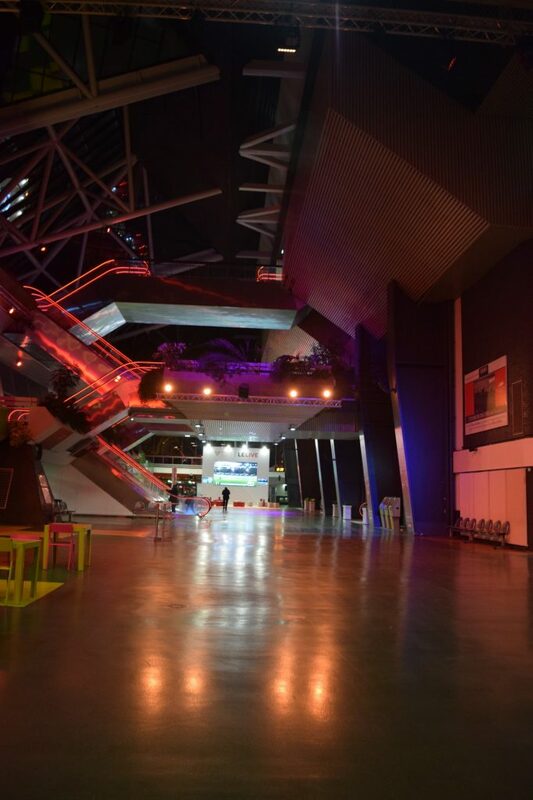 Take a look from ground level. In the US and Canada, we have a starting car that the horses start behind. Europe sometimes uses a starting car. Of the 8 races I watched, 1 used a starting car. The rest are too hard to explain, you have to see to believe. Here is a start under saddle, later is a full race video with a sulky. Horseman often complain getting stuck in the 8th or 9th post position. 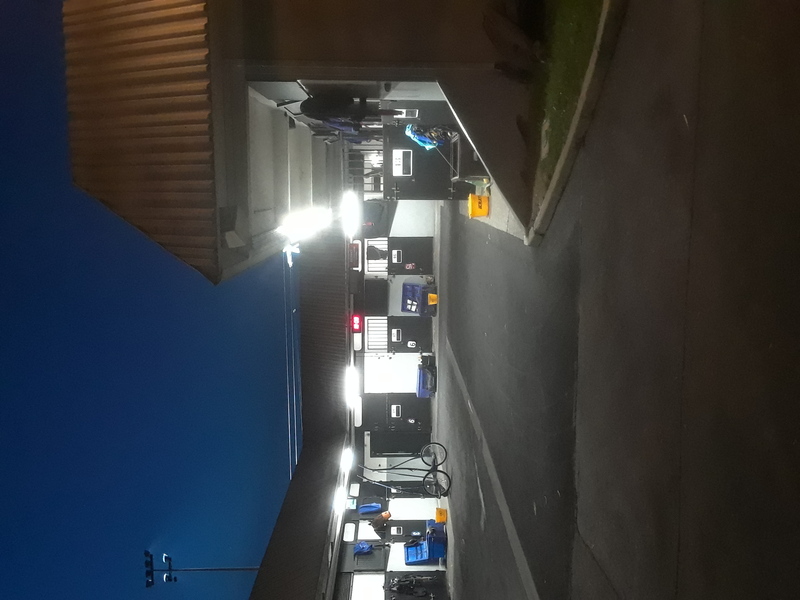 The night I was visiting a couple of races at 10 horses, two had 12 horses, but 15 and 16 horses were the most common. 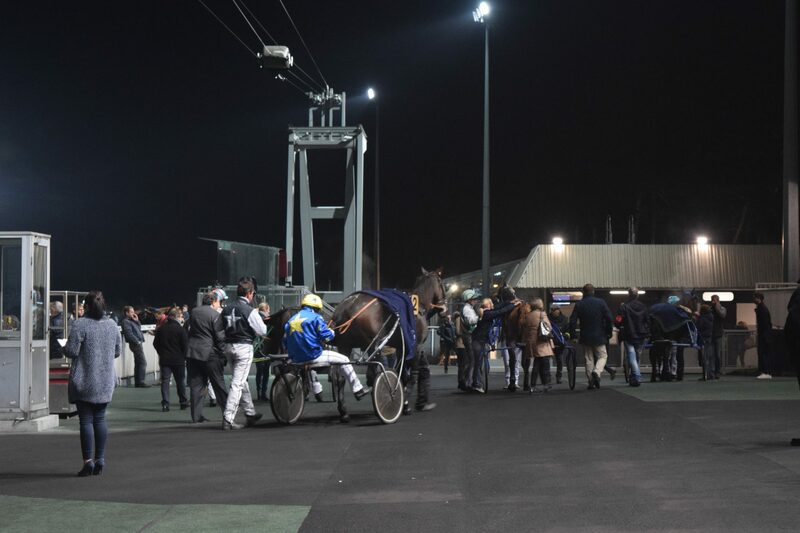 The Prix d’Amérique is the final of a series of races at the Vincennes Hippodrome. This series and the final race is the most prestigious in Europe. It is also considered the world championship. The Prix d’Amérique is raced in January each year with over 40,000 in attendance. It is broadcast live to 35 nations. 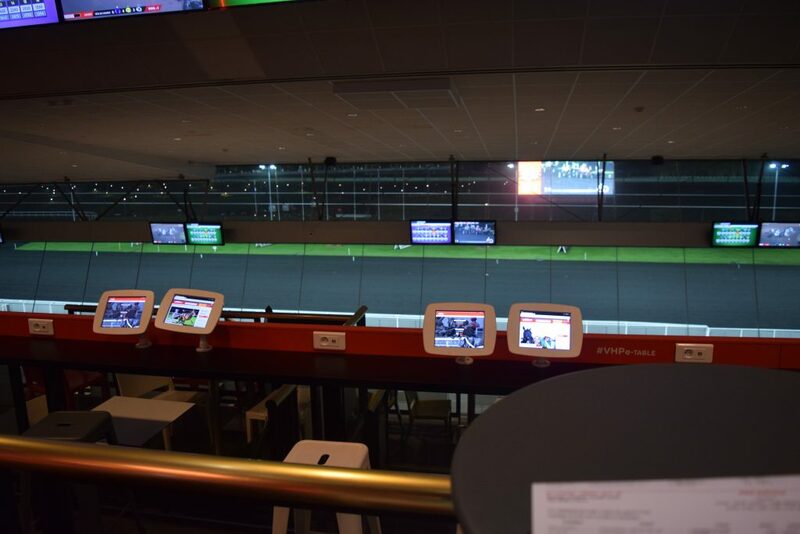 The betting handle for the race is over 40 million euro and over 9 million betting slips are printed. The purse is a cool Million Euro (1.2 Million USD). I was at the race in 1996, and watched David Wade from Rosecroft race SJ Photo. Take a look at this video of the Prix d’Amérique 2017 to see how races are done Paris style. The Vincennes Hippodrome located near the Vincennes Palace in Paris is one of the most famous racetracks in the world. It is here you will find the World Trotting Championships as well as Harness Racing World Triple Crown. The track dates back to 1863 and is one of the largest in the world. 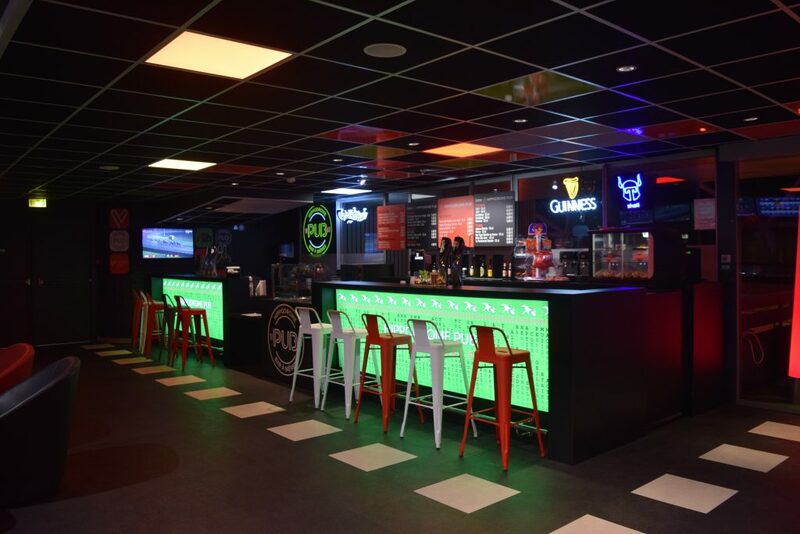 It has a seating capacity of over 60,000 in the clubhouse and grandstands. 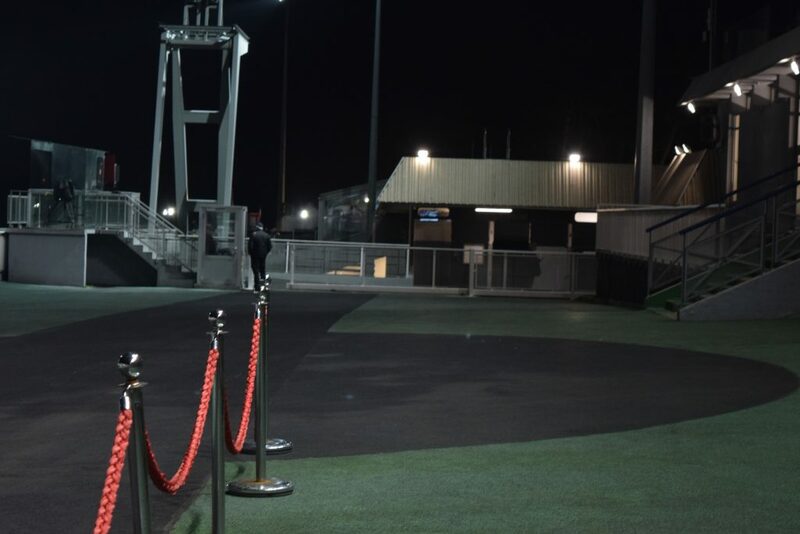 It also has an infield area for parking and other spectators. The restaurants will seat 1,800 people. 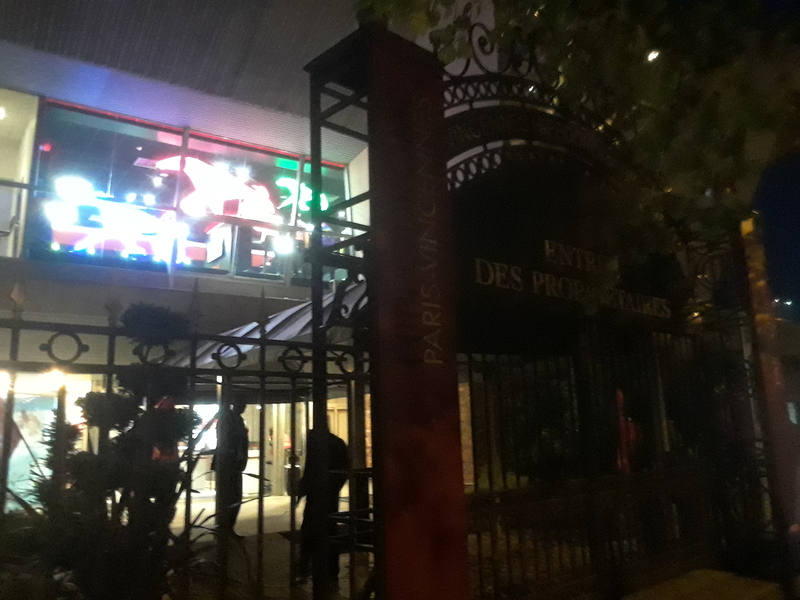 Of the three days I was in Paris at the end of October, I was lucky because one evening of those days they had racing at Vincennes Hippodrome. On the way to the race track, one of my transfers was closed. An attendant directed me to another subway line going to where I was headed. My maps gave me another stop to get off and a transfer by bus to within a 10 minute walk. It was interesting because the walk took me by way of a hiking trail. Still it did bring me to the “race track”. Actually it brought me to the back side of the track and the parking lot there was closed. The entrance was a mile away. For the record, if my internet had been working, I would of found that there was a shuttle from the bust stop to the racetrack, I was just early. 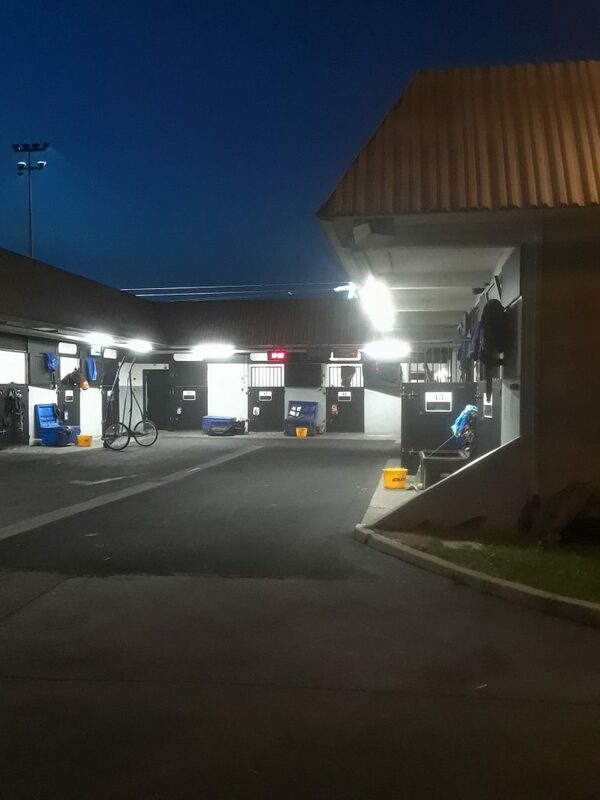 My walk around the outside of the track took me pass the paddocks. The paddocks are on the front side of the track away from the barns, next to the clubhouse. For those not familiar with horse racing, the paddock at a racetrack is the staging area for the races. Horse must be inside the paddock a prescribed time before the start of the race. It is here that the horses are prepared for the races. They looked outstanding, much better than any I have ever seen elsewhere. I arrived about 15 minutes before the gates open. The gates seem to be from the original track built in the 1800s. they have their own club house. Looking in from the outside it was very upscale. However, even the portion for the general public was outstanding. As I mentioned, I was there early. I would have been the first one inside, however, the girl at the ticket counter had no change. The entrance fee is 3 €, the smallest I had was a 10. so I had to wait until she sold some tickets. When I stepped inside I was impressed by the size. I had been there once before years ago, but that was a day of a major race and there were over 50,000 people there that day so did not really get to look around much. Now, there were only a hand full of people at this time. As you entered the building, you were in a hall with four levels of grandstands in front of you. While some of the food outlets were closed, there were at least 5 that were open. From simple sandwiches to 5 course dinners. 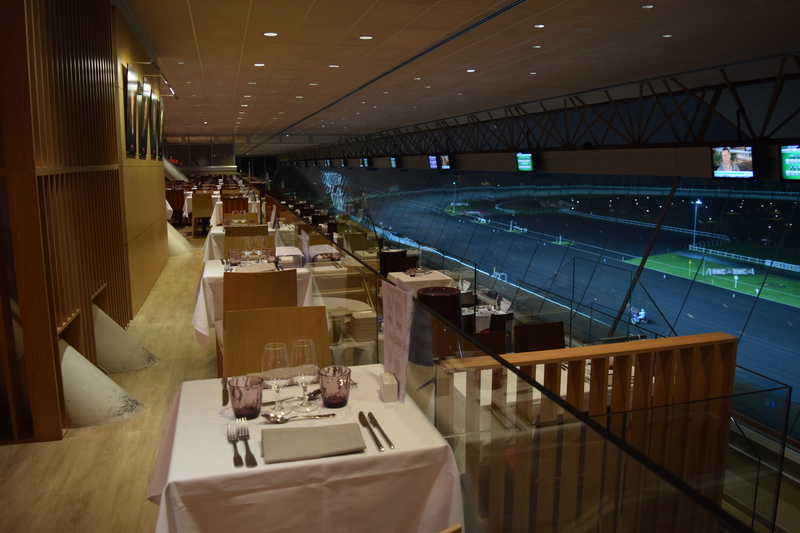 Hippodrome de Vincennes On the ground floor, restaurants on the upper levels. After watching a few races outside ( more on the races in another article) I went looking for a place to eat. Was not up to the fine dining. On the ground level were a couple of places with sandwiches and hot dogs, but I went up to a pub. If you enjoyed this article please share. 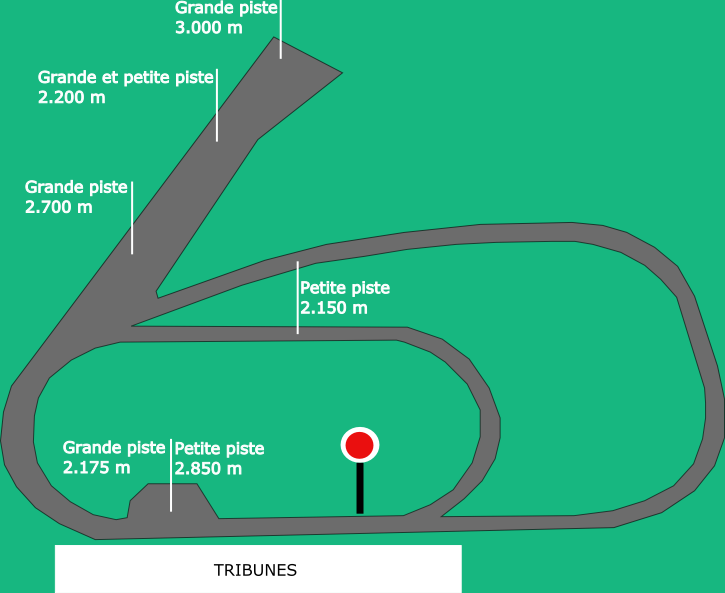 I will write an seperate article about the track and the racing, but here is a preview of the track area itself.